Hyundai, a Korean manufacturer known for its comfortable and solidly built cruisers, has now entered the plug-in hybrid game. The all-new Ioniq four-door plug-in hybrid (PHEV) is their answer to the similarly operated Chevy Volt. This model is in addition to the 2017 regular hybrid and pure electric versions. It’s the first time an auto manufacturer released a single model available as a hybrid, plug-in hybrid, and pure electric runabout. We’ve had a chance to drive this vehicle for a week, so we’ll share our good, our great, and our could-be-improved opinions. Unlike some of its competition, this Hyundai doesn’t look like a crazy eco-centric futuristic car. It doesn’t have crazy body lines, nor a multitude of dash displays you can’t easily figure out. 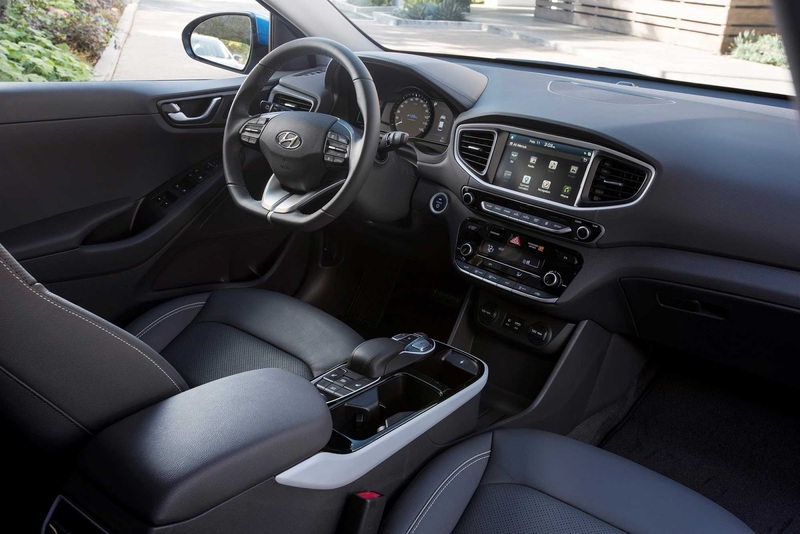 This Hyundai is simplistic in styling, standardized in most features, and is comfortable. The exterior is timeless and well thought out. 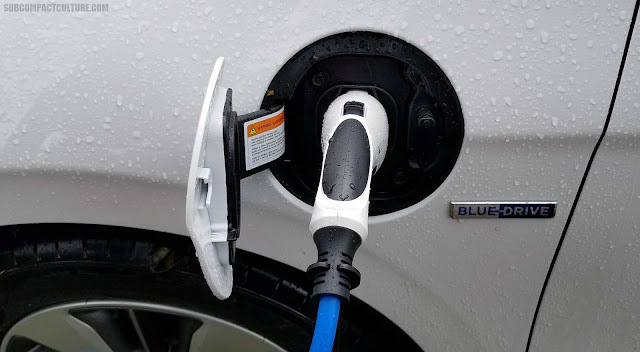 The plug-in port as well as the gasoline door are on the same side. The front, rear, and side views are pleasing to the eye. The Hyundai Ioniq’s looks will serve its future buyers well. It’s a great shade of vanilla—er, ceramic white (exterior)—er, beige (interior color). The dark gray and silver 16-inch Eco-Spoke alloy wheels are wrapped in 205/55/16 rubber. I personally don’t like this style of wheel, I’ve not liked this style for a few years now. But, every manufacturer seems to have glommed onto it; the inevitable multi-tone swirl or stylized wheel. Some are worse offenders than others, but thankfully the Ioniq’s shoes are minimal and not too crazy. (add a few other wheel pics here!) Honestly, I’ll be happy once this “look” gets put to rest. The exterior boasts LED daytime running lights, LED taillights, as well as door handle approach lights that come in handy at night or in poor visibility conditions. The body color-matched door handles and side mirrors blend in well, although I wish this sedan had side mirror turn signals. It does not. This particular test mule also doesn’t have blind spot detection, a feature found on most comparative models. The rear painted spoiler sits atop a heavy lift gate. This four-door machine’s slanted split rear window is fairly easy to see out of when its daylight and the weather is good. However, I wished it had a rear wiper. It does not. It rained nearly every day we had our test model, which proved very difficult to see out of with water droplets permanently residing on the angled glass. Also lacking were fog lights, a nicety in the Pacific NW region where we live. The 2018 Ioniq is nicely appointed inside. The beige and dark gray interior had enough texture and pattern changes to make it interesting but simple. The center stack was also simply styled, although the high gloss black accents will need to be cleaned more times than not—unless you don’t mind finger prints. What I found a challenge were the other buttons on the HVAC system, particularly the “mode” button. I constantly had to take eyes away from the road to find that button in order to switch heat from floor to face, etc. The buttons are smooth to the touch and close together, making it difficult to feel your way around on a dark and rainy morning. Additionally, our test model had a difficult time not being on the defrost cycle. The auto defrost feature kept overriding heat on the floor or face. I’d be 10 minutes into a drive and it would keep cycling back onto auto defrost vs what I intentionally set it at. Perhaps this was a faulty system? Thankfully, the rump roaster heated seats saved the day on the chilly mornings. The rear cargo cover amply hides your groceries but it’s finicky. It seems to get stuck half way back; it delays its slide for several seconds until it decides to fully retract. If you push it back yourself the fabric tends to jamb in its guided track. That’s not very convenient when trying to stow a very heavy laptop roller bag. The Ioniq comes with interior accoutrements creature comforts such as Bluetooth, Android Auto or Apple CarPlay, dual temperature control, heated seats, paddle shifters, and proximity key with push button start. The 2018 PHEV Ioniq includes 27 miles of all-electric range and more than 650 miles of total range. EPA ratings give the Ioniq 52 MPG gasoline only and 119MPGe for combined city and highway. This model houses a six-speed EcoShift dual-clutch transmission that delivers power smoothly without the annoying whine of a CVT. This transmission also offers a sport mode with full manual control. The car is powered by a 1.6L gasoline direct injection Atkinson cycle four-cylinder hybrid engine. Also on board is a permanent magnet 44.5 KW synchronous motor, for a combined hybrid power of 139 HP. The Ioniq rides smoothly, comfortably, with no noticeable issues. Two driving modes are offered up: eco and sport. The sport mode gives you a bit more pep, but nothing to write home about. Mind you, this isn’t a sports car so you shouldn’t expect it to handle or drive like one. One item to note: there is a small lag in response when depressing the gas pedal to move. FYI, the gasoline engine is used both as a generator for the electric motor and can power the front wheels, too. 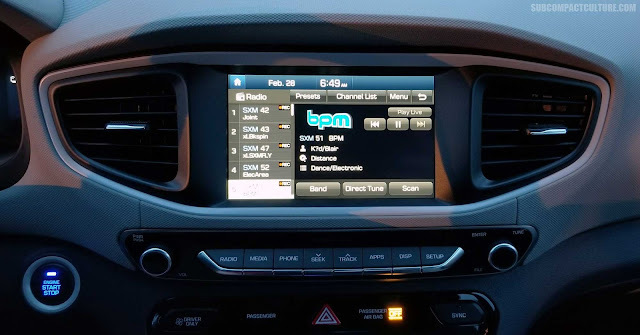 There is a handy display of how the power is being used in one of the Ioniq’s multiple menus displayed in the gauge cluster. While the Volt and Prius Prime let you lock in electric mode for daily commuting, the Ioniq’s plug-in hybrid powertrain behaves more like that of a Ford Fusion or C-Max during certain situations vs a sole electric eater for the first 27 miles. The gasoline engine definitely fires up more often than initially anticipated. It’s not possible to lock in a sole EV mode. I’ve noticed the non-electric mode when accelerating quickly, heavier engine load, vehicle speed, or taking off spiritedly. The ceramic white Ioniq test model has Hyundai’s 5-year, 60,000 mile new vehicle warranty, 10-year, 100,000 powertrain and hybrid system components warranty, as well as a 5-year unlimited mileage roadside assistance warranty. One thing I did want to mention: the Ioniq's charging 110V charge cord is short, so you'll have to get close to your outlet. Our Ioniq was partially on the lawn in order for the car's charge cord to meet our nearest outlet. I'm sure our neighbors were thrilled. If you’re looking for a plug-in hybrid that’s solid, comfortable, and not over stylized, consider the 2018 Hyundai Ioniq plug-in hybrid. It’s got loads of creature comforts, isn’t eco-chic overstyled, has a wonderful warranty, and is especially simple. If simple is what you want, than the Ioniq plug-in hybrid is your perfect shade of vanilla.